I had a professor at Oklahoma State that I really enjoyed, named Dr. Urich. I took several of his classes, but I think what stuck with me more than his course material was some of his common-sense teaching. One night, he talked to us about the stats of people who read books after completing school versus those that don’t. He presented the stats in the infographic below. My memory is a bit fuzzy, but he mentioned in class reading 100 books or maybe it was a list of his favorite 100 books. Either way – I decided that was a goal I wanted to accomplish. More than ten years later, I finally completed that goal of reading 100 books. It’s funny; when I talk about this goal to people, I usually get one of two reactions. 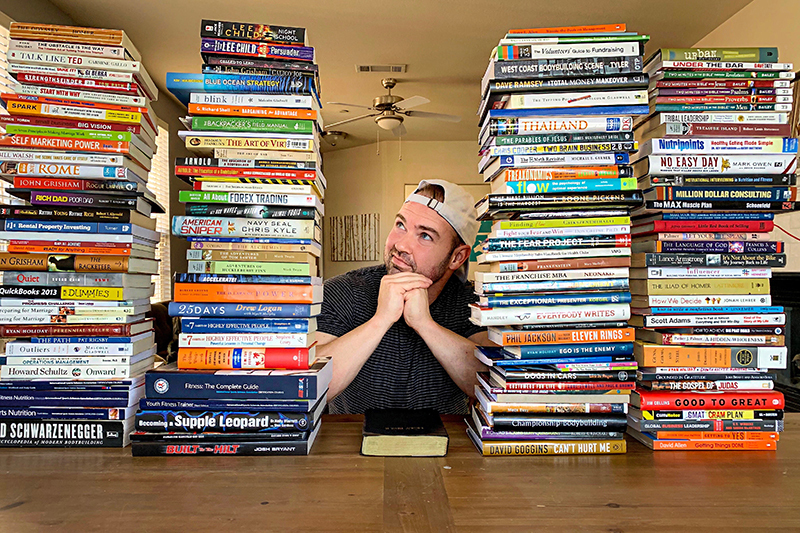 The avid reader replies, “100 books…what, in a year?” and the non-reader replies, “Holy crap; who has time for that?” It took me a long time to complete this. In those more than ten years since Dr. Urich’s class, there were years where I read a lot of books and there were years where I maybe only read a couple. The past three years have been pretty consistent. I wake up earlier than I need to, have some coffee, and try to read for at least 30 minutes. I don’t force it – if I don’t feel like reading, I don’t. But most mornings, I look forward to it. Some mornings when I have more time, I’ll read for more than an hour. I like to think of books as my mental diet. If I put the right things in, then I get outward results. When I read about business, my business improves. When I read about personal finance, my bank account grows. When I read about bodybuilding, my muscles grow. When I read fiction, my imagination grows. No matter what I read, I feel like my perspective expands, my vocabulary improves, and I just think better. What’s the point of reading 100 books if you can’t remember what they say? As I knocked books off of my list, I would do nerdy stuff like divide up the books by category and see what topics I was reading more of. I tried picking out future books by category, but after a while I dropped that and just read what I felt like reading at the time. That was the key to keeping it fun and enjoyable. I wanted to make sure I was retaining the best parts of all of these books. 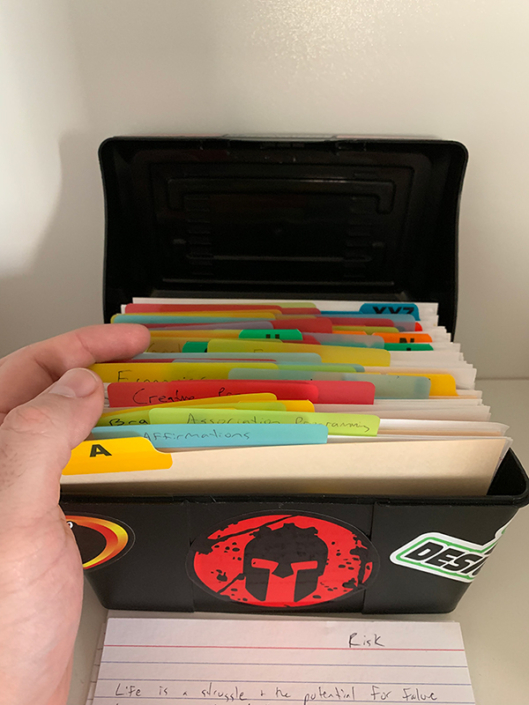 I wanted a system of note keeping where I could reference all of my favorite parts, quotes, and thoughts. After reading Ego Is the Enemy by Ryan Holiday, I started following Ryan online. I thought I liked reading until I started following Ryan; that dude READS. 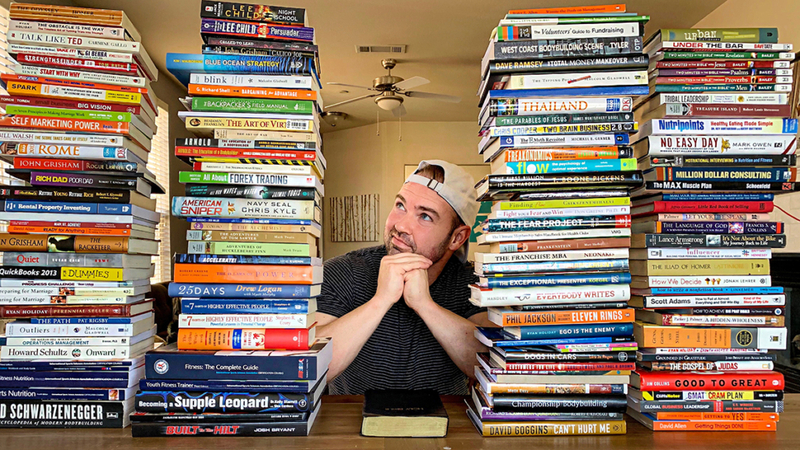 I found a series of blog posts (check it out here) he had done about how he keeps notes about his reading so that when it comes time for him to write a book, he has a system of notes in an order that he can easily reference. BINGO! I didn’t exactly copy Ryan’s system…but close. I keep a box of 3 x 5 note cards. In this box, I have categories divided up alphabetically. 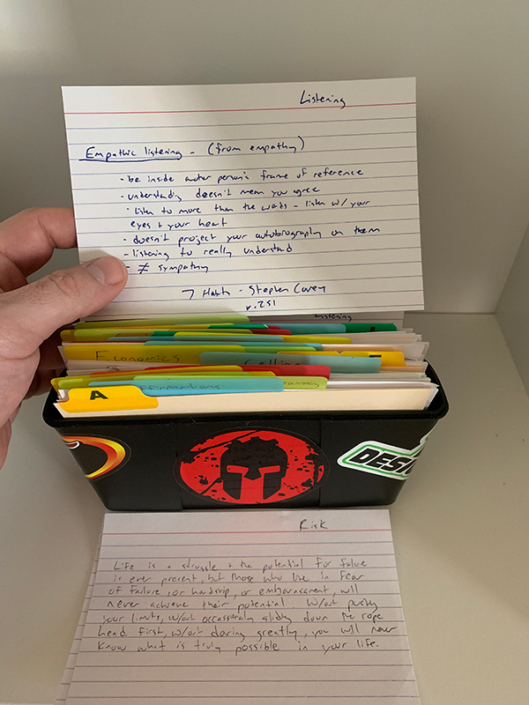 Every time I read a book, I put thoughts, notes, quotes, and stories that are impactful to me inside this box and in the appropriate category. It’s pretty simple, but I’ve found myself using it a lot. It has also been cool when books interconnect that you don’t expect. For instance, one of my top five business books (as you’ll see in my ranking below) is Tribal Leadership. Over three years after reading Tribal Leadership, I was reading Phil Jackson’s book Eleven Rings and he talked in detail about his use of Tribal Leadership. This was awesome and having my old notes from Tribal Leadership was great at that time. I have people asking me for book recommendations pretty often, so I thought I would rank my favorites from a few different categories. https://gregmccoy.net/wp-content/uploads/2019/04/featured-image-2.jpg 675 1200 Greg McCoy /wp-content/uploads/2018/12/logo_large.png Greg McCoy2019-04-04 14:54:272019-04-04 14:58:27100 Books!